Untouched descents bathed in an ethereal blue hue. Pristine powder fields with dense white snow. The pale golden glow of the winter sun as it hangs low on the horizon. Mountains painted in the vivid colours of aurora borealis. The northernmost parts of Norway are exposed to a range powerful overhead sights all year round – from the polar nights and northern lights of winter to the bright nights of summer. 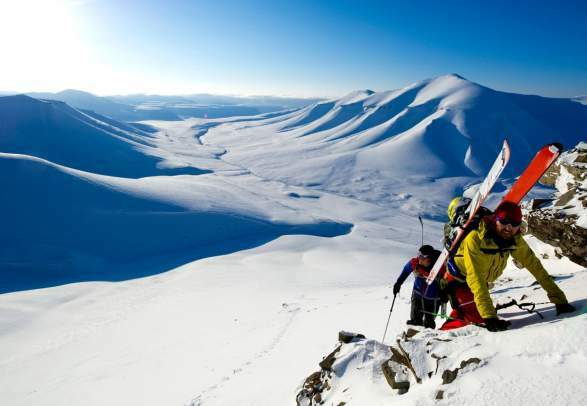 In combination with its fantastic, and in many cases still unexplored, ski potential, Northern Norway is a hot tip for your next ski touring adventure. A few destinations of particular note are the archipelago of Lofoten, the Lyngen alps and the island of Senja. In any of these areas you can expect a thrilling skiing adventure with a seemingly endless selection of grand views. The cities of Tromsø, Narvik and Bodø all offer easy access to untracked, crowd-free runs while providing a comfortable base for après-ski. If you want a rest day, you can take the opportunity to explore local attractions like the Arctic Cathedral and Polar Museum in Tromsø, the Museum Nord in Narvik and the beautiful former trading post of Kjerringøy near Bodø. Skiing under the midnight sun. Ski touring in Vågan on Lofoten.